In planning urban and agricultural/nature environments and infrastructure, we always have to take into consideration different views on the same area. Many stakeholders have equally many opinions on the current use and future of an area, and all have to be accommodated. The quality of our environment –the Spatial Quality- is a matter that affects us all, whether we are responsible for the planning and management, live there, or just happen to pass through. Within the framework of river restoration – I have developed a method to assess, discuss and plan the Spatial Quality of any area. This model was the inspiration for a 6-episode documentary by Omrop Fryslân on the Spatial Quality of the Province of Fryslân in The Netherlands called Moai Fryslân (see: http://www.omropfryslan.nl/). This model can be applied to new projects to come to a shared view on the future of our landscape. 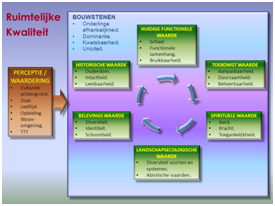 To fully understand a landscape - you first need to do a LESA: a Landscape Ecological System Analysis. A ‘Landscape Ecological System Analysis’ or LESA is the anchor all management- or spatial plans. It is a comprehensive description of the landscape in a study-area, how it functions and which processes determine the presence and distribution of flora, vegetation and fauna. This is the basis for sustainable long-term management and planning for an area. A LESA is also used to assess the financial investments and risks. A LESA starts as a desk-study, with a broad perspective and quickly zooms in and focuses on the area involved and identifies relevant and verifiable questions and their priority. Next is a field check, after which analysis of the field data and synthesis takes place. During this procedure one continuously develops and tests verifiable hypotheses concerning the functioning of the area. A team of landscape ecologists is able to provide you with a quick, comprehensive and thorough LESA for your area. You can see our work at: www.stromendlandschap.nl, and download the small guidance book through the link below. For a LESA, integrated knowledge of all aspects involved is paramount, yet one has to be very aware of the limitations and certainties of all these disciplines. Plants, the language of the field, have proven to be the most reliable witnesses for understanding the landscape and hold a higher authority than maps, written sources or computer-models. It can also be downloaded here: Artikel Vakblad Natuur en Landschap. SAND website http://www.ecrr.org/sandproject/sandproject.htm and the book http://www.ecrr.org/sandproject/book/SAND_BOOK_low_res.pdf . You can approach me for an analysis of the Spatial Quality of a project, through the contact form or mail me directly through: juniperservices@hotmail.com or call +31(0)621818839.